The fall edition of SPES’ quarterly e-newsletter is out and we hope you’ll enjoy reading about what we have been up to over the summer and how you can get involved in the coming months. Click here to read it. It’s easy to forget that nature on our doorstep is threatened as we celebrate the work that has been done and the great wildlife that live in the park. For the main story we wanted to highlight that much is at stake for not only Stanley Park but also much wider afield if Kinder Morgan’s proposed Trans Mountain pipeline expansion from Alberta’s tar sands to Burnaby, BC goes ahead. Tanker traffic navigating the Burrard Inlet could increase to 300 tankers, up from 22 in 2008. Oil spills of one size or another would be inevitable, and not only would a major oil spill devastate our local marine ecosystems for many decades, smaller and more frequent spills (termed “normal spillage”) from minor ruptures and routine operational releases at docks will also have lasting impacts on marine life. 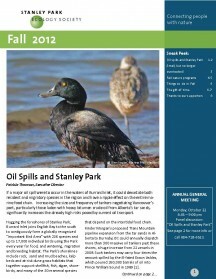 Read more the impacts of the pipeline expansion, and much more, in the newsletter.